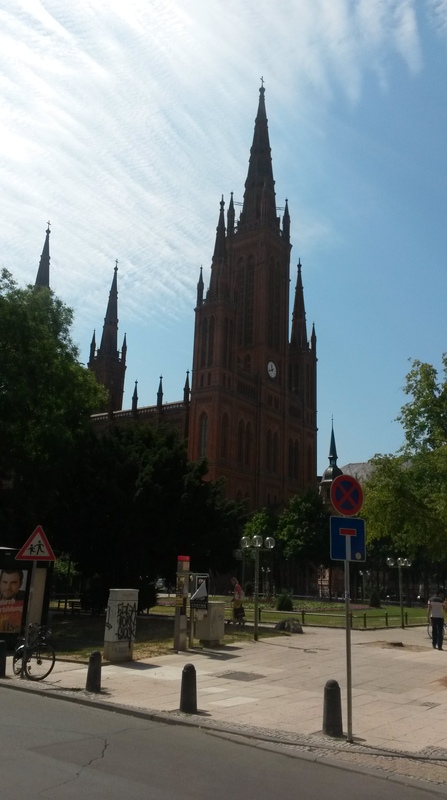 This morning I got up a bit earlier than I normally would on a Saturday in order to go on a walking tour of my new home Wiesbaden. Unfortunately due to my own unfamiliarity with the city, the confusing directions from Google Maps, and the confusing language from the ad I got for the tour, I missed the tour. I did run into some folks from the base whom I’d seen around, and they were kind enough to help me look for the group before I concluded that it was too late and I’d missed them. And after talking with these people and parting ways, I decided to go on a walking tour of my own, visiting the locations I remembered mentioned in the ad. And you know what? It was a lot of fun. Swear to you, this is an actual store. 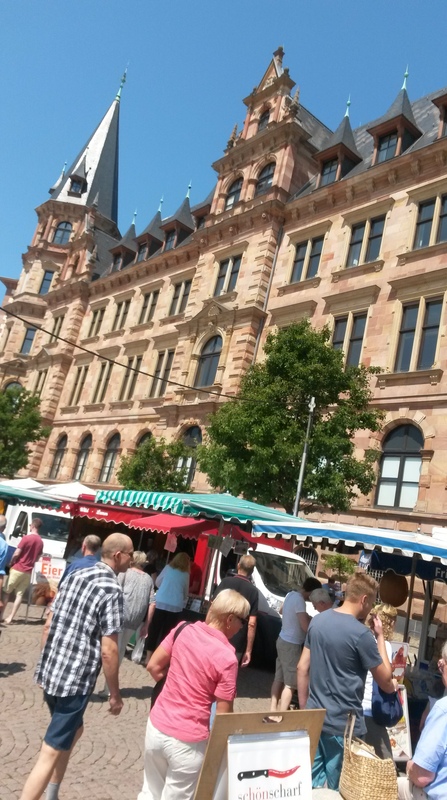 I was in an area known as the Marktplatz which, as its name hints, is a market or shopping area with lots of different stores and even a farmer’s market going on. 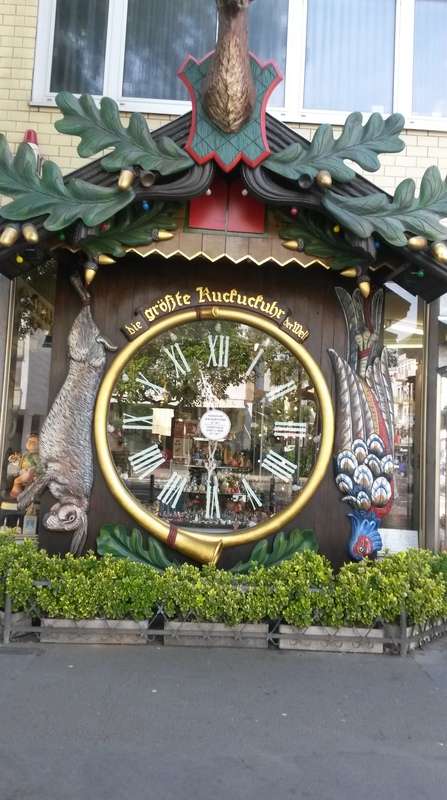 My first stop on the trip though was this really interesting shop whose front is a giant cuckoo clock. Inside were a number of English speakers who were very kind. We talked about me moving to the US Army base, about the American presidential elections, and about other stuff. I bought a couple of postcards and promised to come back sometime (and I intend to. That shop had curiosities that gave me an idea for a short story. You have to give them props for that). I then ended up taking a look around the Marktkirche, or Market Church, a huge cathedral of reddish bricks that apparently prides itself on its music and concerts, based on the CDs for sale and the fact that a concert let out just as I got to go in and see the place. You know, I may not be Christian, but that doesn’t keep me from having an appreciation for places like the Market Church. There’s a powerful history there, and you can feel it in the stones, like energy. It’s love and devotion to God, pure and simple. Sure, this church has probably seen its fair share of fiery sermons, but for the most part it’s love, and the architecture, lighting, art, and layout help to amplify all that. I spent quite a few minutes just sitting there and taking it all in. I also took a few minutes to figure out the identities of the five statues around the altar. I recognized Jesus, but it took me a little work to find out the other four were the Four Evangelists (did not know the Gospel writers had a special name). Then I got an idea for a short story, which made me happy. Two in a single day! 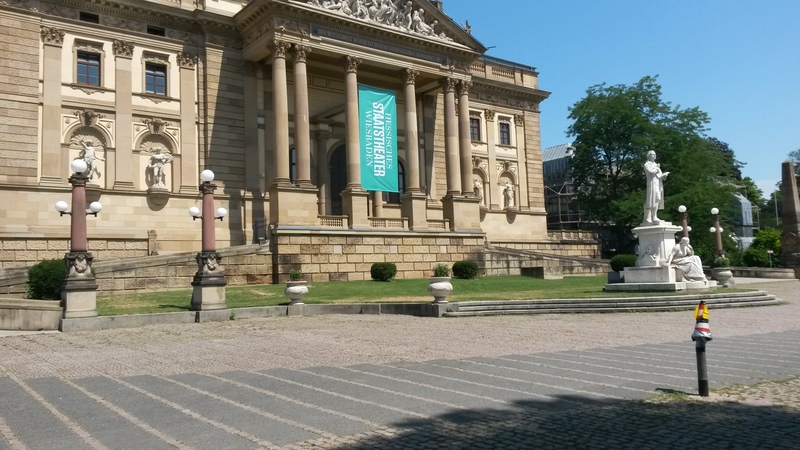 After that I grabbed a quick lunch and went to check out the Staattheater or State Theater, and got information on whom to contact to tour the theater (apparently it’s a really amazing interior, but they only do group tours on certain days). After that I checked out the Casino, which is not like your American casinos where anyone goes in to play a few games. 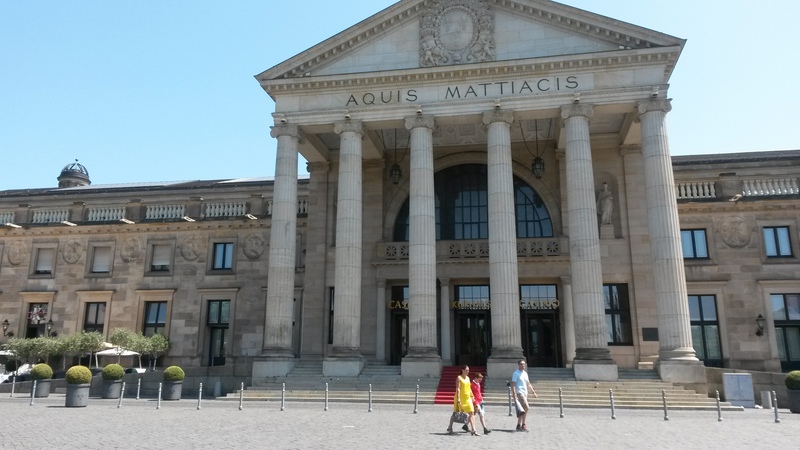 Take a look at the photo: this casino was designed as a gathering place for the rich and noble to socialize and gamble. Even today there’s a dress code if you want to play at the roulette wheel, and they hold huge events there for big VIPs (the Dalai Lama is apparently in town tomorrow and speaking at the Casino. I’d go, but I don’t feel like getting up at the crack of dawn to get a good seat so his translator can speak to the crowd in German). Yeah, the Casino looks like a roman temple or something. After losing my savings at the roulette wheel and slots (kidding! ), I explored the park by the theater. And that was wonderful. In America, with TV and games and the Internet, we get so caught up on being inside and having fun inside and inside fake worlds. Rarely do we take the time to enjoy outside, and this park kind of reminded me of that, as well as wonder can be found in nature. 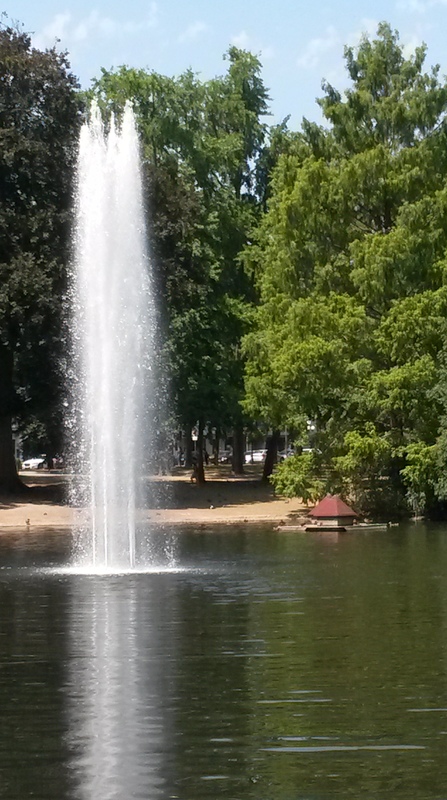 The lake in the middle of the park with the fountain reminded me of Ohio State’s Mirror Lake, as well as the pigeons and giant ducks living around the lake having absolutely no fear of humans (seriously, one got within a few feet of me and didn’t flinch. I swear it wanted to either see what I was or challenge me to a fight). And there was this little creek right by the lake that looked so peaceful and pretty, like out of a fantasy story. It was really relaxing. Like being back at school, in a way. Well, after that I headed home. And while I didn’t visit all the places the tour group was going to go (I missed the Roman Wall, which I will have to find some time), I did get my own little tour and got familiar with the city I live in now. And when I get a chance, I’d like to go explore again and see what this city has to offer. And next week, if I decide to do that tour of Frankfurt (and I think I will), I’ll make sure I have a much better idea of where it is before I go to it. Seriously, I’m not getting up early for a day trip not knowing where we’re meeting! Anyway, I’m definitely enjoying being here in Germany, and I’m looking forward to doing and seeing more as time goes on. Heck, I’m thinking of taking some trips to Munich or Stuttgard one of these weekends. That should be exciting. Well, until next time, my Followers of Fear. Guten Nacht! So am I. I hope to do more in the coming weeks (though tomorrow I might be stuck doing reading for work). I’m impressed with what you did already. Whenever I went abroad for a longer time, I was always so busy (and quite frankly tired) the first couple of weeks that I couldn’t do much more than work/study and take a walk around the block. Well, I do have to do a lot of studying and working. And a couple of times these past couple of days I have nearly fallen asleep while doing either of those things. Which is probably why I slept in this morning. I remember being tired all the time, mostly because of the language and my brain constantly needing to concentrate. I guess you don’t have to deal with people talking German at all time though. Nein, I don’t. I just wish I had more time for German though, or at least to learn it. Take your time to adjust to everything and when you get into a certain routine, there’ll be more time for other things. Oh, I definitely had more fun. I just wish I’d brought the booklet that advertised the trip so I could go and see all the places I missed. Indeed. And I’ll definitely take advantage of one soon.